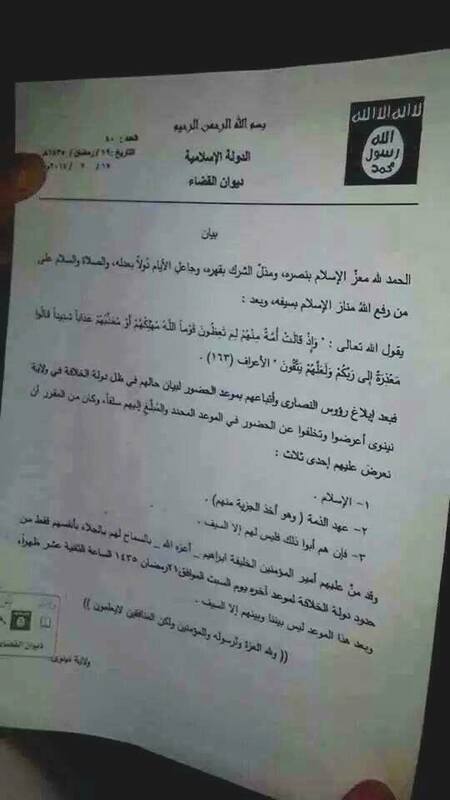 Yesterday ISIL issued an order for Christians to convert, pay the poll tax or leave the city. As they flee, Christian families are stripped of all their worldly possessions: cars, papers, money. Dialogue or words are no longer possible. Helpless witness to an unfolding tragedy, Mar Sako acknowledges, "Our hands are tied." Baghdad (AsiaNews) - "The situation in Mosul is tragic," said Mar Raphael I Louis Sako, Patriarch of the Chaldean Church, as he spoke to AsiaNews about what is happening in Mosul, Iraq's second largest city. His Beatitude said that yesterday, the "militia of the so-called Islamic caliphate" issued a notice (pictured), distributed across the city, declaring, "Christians either convert to Islam or pay the [poll] tax" (the Jizya). Alternatively, he noted, they "can only leave the city," leaving behind everything they own, which the Islamists are seizing. When Mosul fell to Islamist militias, at least 500 thousand people, Christians and Muslims, fled the city, creating a serious humanitarian, economic and political crisis. The city is now under the control of the Islamic State of Iraq and the Levant (ISIL, a Sunni jihadist group close to al-Qaeda), operating as the militia of the Islamic caliphate. Nothing the central government has done so far has changed things, not even air strikes. Contacted by AsiaNews at the See of the Chaldean Patriarchate in Baghdad, Mar Sako bitterly said that no form of dialogue is possible with the Islamists, who keep repeating, "between us there is but the sword." The patriarch has had to "call on the bishops to urge Christians to leave". Hence, as of yesterday morning, those left began to clear out. Now only "very few people, the poorest among the Christians" are left "because they do not have the means to escape." Those fleeing Mosul "are welcome in the monasteries, in the villages." This morning, Mar Sako added, "cars equipped with loudspeakers are driving through the city, telling Christians to flee. At checkpoints, militias are seizing cars, money and papers from Christians, before letting them go . . . with nothing." In this tragic context, in which Christians are being expelled, it is hard to see how talks or negotiations can be undertaken. "There is no authority to deal with, no one," the Chaldean patriarch said. "We do not know where they came from, what they really want. . . . The central government has no contact and now has started air strikes". Speaking about the Islamists, Mar Sako said that they are "a wall" with which "any form of dialogue" is impossible. And the situation is changing quickly, by the day, and always for the worse. "I recently made ​​a statement, saying that [ISIL] had nothing against Christians," he said. "Now the reality is different. The situation is getting out of hand and the refugee situation is getting worse. There is no water and power. Children cannot go to school and many fathers have not been paid for two months; there is nothing we can do, our hands are tied." In recent days, Iraq's parliament picked a new speaker, but the country still has no president or prime minister, further plunging into chaos. According to UN sources, in June alone, at least 2,417 Iraqis, including 1,513 civilians, have died "in acts of violence or terrorism." More than a million people have fled because of fighting between the Iraqi military and Islamist militias. This is worst point since December 2011, when US troops left the country. Patriarch Rahi: "What do moderate Muslims say" about what is happening to Christians in Mosul?